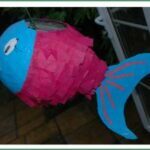 Well.. as you may have seen, we recently did some Post It Note Pinatas and now we have a Monsters Inc Pinata. 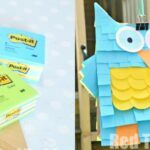 They owl and first monster pinata were SOOO simple and SOOO fun, I couldn’t resist making another one – this time a Monsters Inc Pinata! 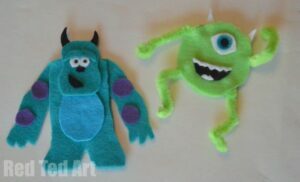 The green monster from last time really reminded me of Mike and I thought I would challenge myself to a Sulley Pinata. 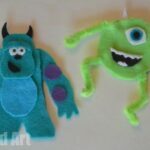 Sulley was almost as easy to make as the previous Pinatas.. it only required a TINY bit extra! 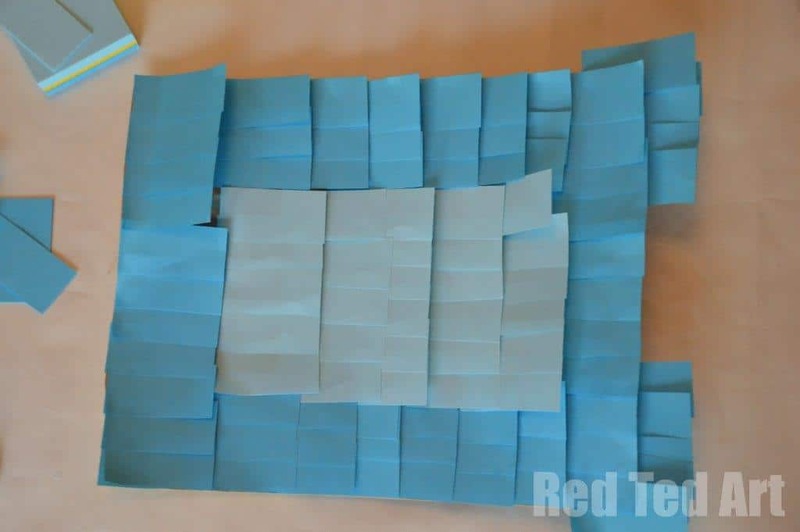 1) Cut, your posts in half – so you have long thin strips with the stick bit at the top. 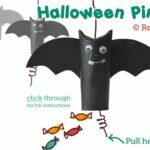 As with our Owl Pinata – we started at the bottom. 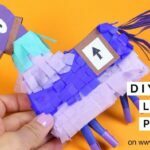 The BOTTOM of your paper bag, is also the bottom of your pinata. 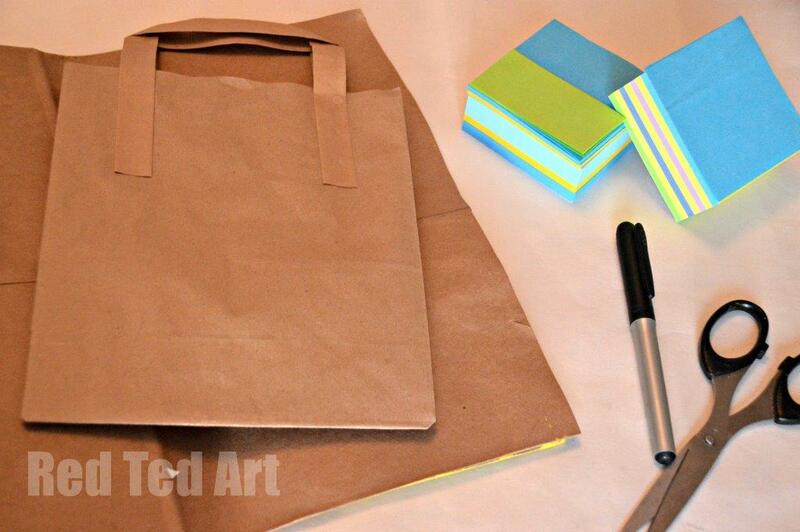 I added extra post it notes hanging off the paper bag for the “monster feet”. Then a layer for the bottom part of the monster. 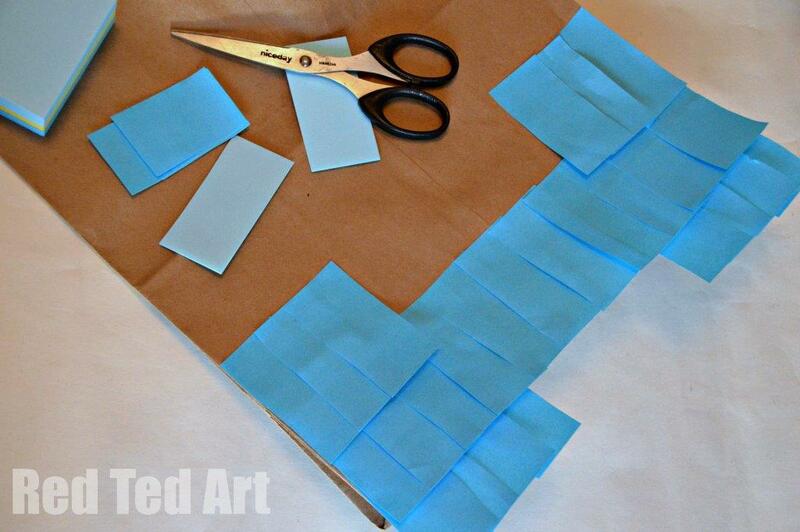 Then add two medium blue vertical lines on either side of the paper bag – leaving the centre free for Sulley’s light blue tummy. 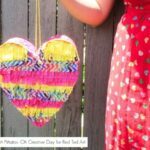 2) If you live in a windy area you **MAY** want to stick your pinata strips down with a bit of glue stick. Our Owl and Green Monster Pinata were fine as they were.. but for some reason Sulley lost the odd post it note. So to play it safe may be add a little glue. But just at the top of the post it! 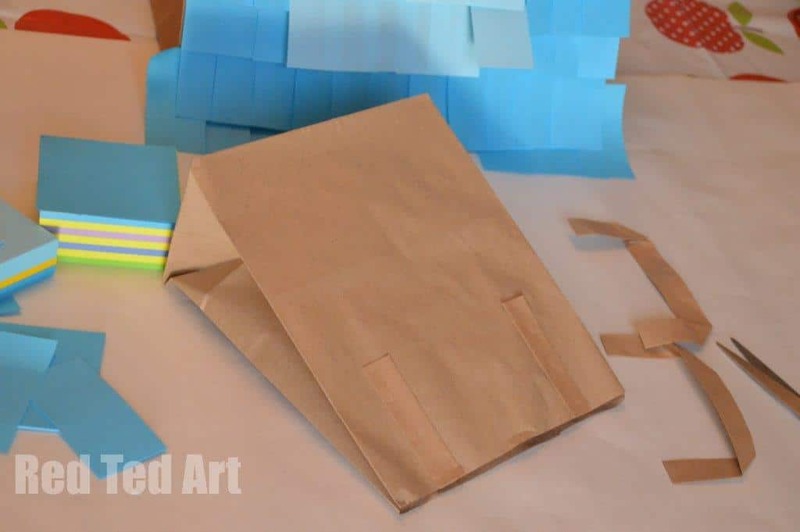 3) For the head, I took the smaller paper bag, which happened to have handles on – cut these off and added a lots of medium blue post its. 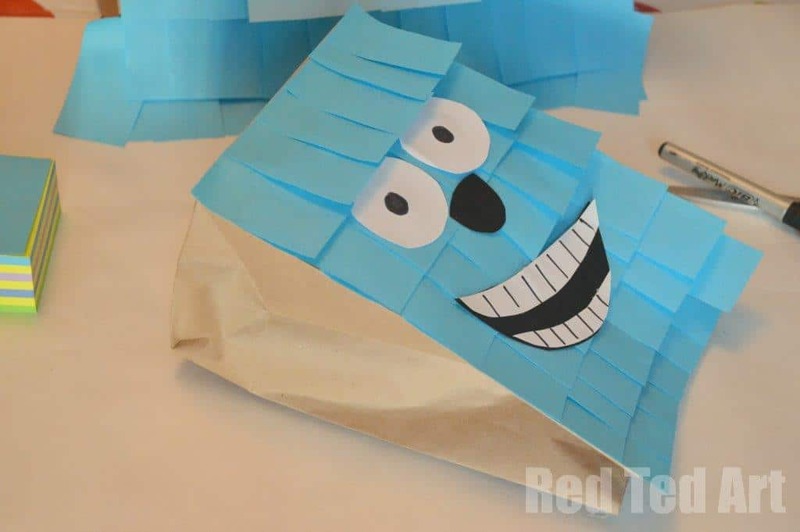 This time the OPENING of the paper bag is the BOTTOM of your Sulley head. This is so you can later pad it out with bubble wrap or plastic bags and give it a head shape. 4) Then I cut out some eyes and a noes and mouth from paper and glued them on. 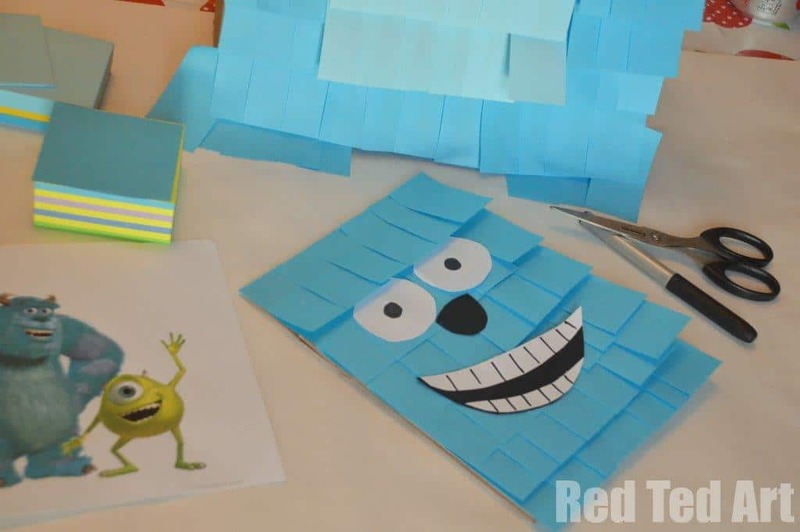 I found the eyes looked most effective if you placed them UNDER a layer of post its – to give them that Sulley eye brow effect. 5) Pad our your bag… stick shut. Add some horns and with stronger glue (I used some PVA / white glue), stick to the front of your main Sulley body. Then colour in some toe nails. 6) Finally fill with treats, add some stuffing to pad it out and add some string for hanging! Remember to add some little “nicks” into your paper bag to make it easier to break!! All done! What do you reckon? 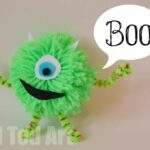 Perfect for a Monsters Inc Party, no? 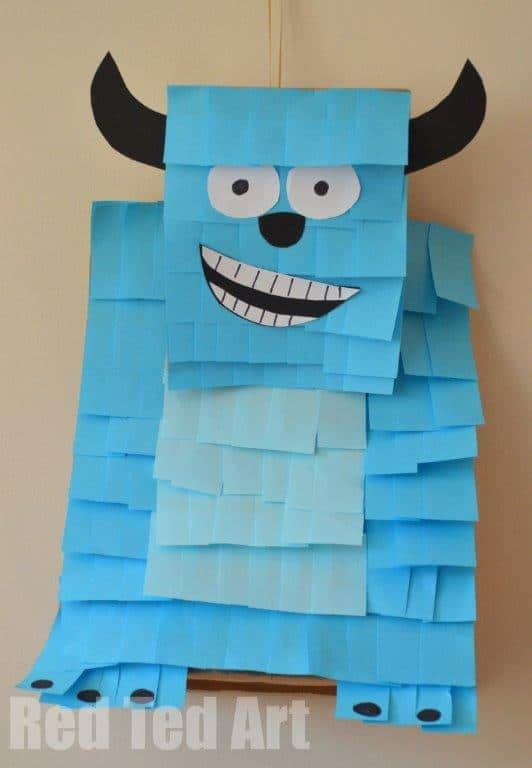 Though not sure I really want to break our Sulley Pinata. He is too cute!!! I know!! THAT is the main problem!!!! Really fabulous well done you! Oh my goodness, this is just too cute! 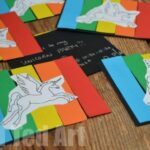 Pinny this to my birthday board on Pinterest! Pinned it and tweeted it — so cute! how do you attach the head the body??? I glued it on with some PVA glue (as a little stronger than a glue stick or you could tape it on). Oh my, he is too cute!! Thank you! We rather love him too!